Try game free for 30 days! How to access (get into) my subscription? Race for the Stars includes two 11 x 17 game boards, one for levels A-K and one for levels L-Z. For each game board there is a set of 24 matching math fact problems. Race for the Stars games come in all four operations. The aim of the game is for players to lay the 24 problems next to the 24 answers on the game board as quickly as possible. Each round should generally take between 45 and 100 seconds. Our handy Race for the Stars Game Directions explain several ways to play the game. Both levels of these games will be fun review for students who have mastered the facts in each level using Rocket Math Facts before beginning to play with the set in the game. 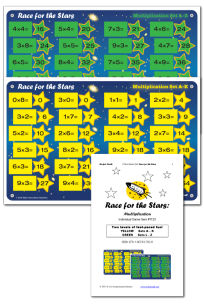 Race for the Stars gameboards are colorful and laminated on durable chipboard. The 24 playing pieces punch out of the game board, so we include baggies for storage. SKU: N/A. Category: RACE FOR THE STARS GAMES. Set up a Math Facts Game Center in your room. 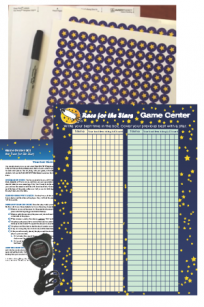 Everything you need*** to set up an exciting and engaging Game Center in which students compete against themselves to beat their best time completing the Race for the Stars Game boards. Students time their partner (using the included SILENT stopwatch) completing the game board and post the time on the included poster using the included pen. A sheet of 60 computer-ready Avery name labels is also included. When students beat their posted personal best they put up the new time and cover the old time with a star sticker (plenty are included). A place for best times for both the A-K game board and the L-Z game board. Directions are included. Click here to view the directions now. **You’ll need the games! If you don’t already have them, the Race for the Stars Game must be purchased separately. $24. (Equal to 15 individual games in a filing crate.) 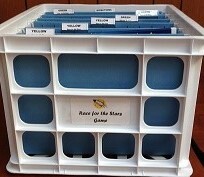 Already set up in a filing crate, the tournament crate of games can easily be rotated among six classrooms. The Tournament crate includes 15 game boards at each level, for a total of 30 game boards set up in a file crate with six hanging files for the games. Every student in the class can be playing and practicing simultaneously. Class-wide contests, racing against the clock, setting speed records, paired competition and even tournaments are some of the many ways to play and make learning math facts fun! Each board has 24 punch out playing pieces, and we include baggies for storage. Free shipping. A $360 value.